HomeWhat is Sales Performance Management? Sales organizations are increasingly realizing the need for solutions that help them build and foster successful sales organizations, that make them more efficient and competitive, and that drive transparency into their complex operations. There is a strong demand for sales performance management (“SPM”) solutions for organizations in many industries. Sales Performance Management is an innovative practice focused on driving optimal sales performance with use of next-generation tools and metrics-driven best practices. SPM solutions provide end-to-end capabilities for complex operations, including territory & quota management, incentive compensation management, and powerful reporting and analytical capabilities. InnoVyne’s SPM solution addresses real-world challenges by enabling companies to better manage their performance, automate operations, promote behaviors, and foster best practices in their sales organization. How does my compensation plan work? If something is wrong on my commission statement, how can I get it fixed quickly? Are the compensation plans working? Which people should I focus my energy on? Contact the team at InnoVyne by submitting a business inquiry online. 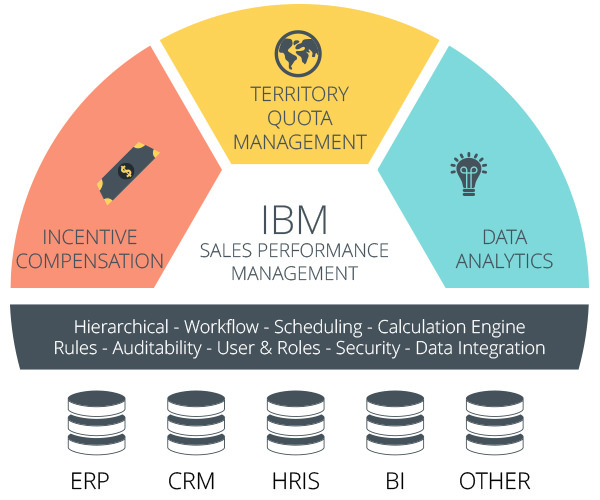 At InnoVyne, we specialize with IBM’s suit of SPM products, which includes Incentive Compensation Management (ICM), Territory and Quota Management (TQM), and Data Analytics. The ICM solution is used to automate all the calculation, tracking, and management of your variable pay programs, as well as provide visibility and modeling ability to your sales teams and management into payouts and metrics. The TQM solution is used to establish and manage quota and goals setting, and to assign and manage complex territory management and crediting rules. And Data Analytics is designed to help you optimize your ICM and TQM models to have powerful dashboards and information at your fingertips when you need it to make critical business decisions quickly and easily. With the Federal Reserve becoming stricter around incentive pay legislation and the enactment of Dodd-Frank reforms, the need for a flexible and automated incentive based compensation system is necessary to stay on-track and competitive in today’s marketplace. The Insurance industry is fiercely competitive and complex, with companies offering many products through numerous channels. Because of its unparalleled flexibility, the IBM ICM solution is being used today at many of North America’s top insurers to manage these challenges. The medical device manufacturing industry has a great need for highly flexible and scalable SPM solutions. With frequent M&A activity, continuous product innovation and generally very complex crediting rules, implementing a robust, flexible and scalable SPM solution gives companies a competitive edge. In the telecommunications industry, selling through various channels is the key to success. This presents a challenge for companies on how to handle sales compensation – specifically around quota and territory management which have very high transactional volumes and activation based compensation plans. Retail organizations regularly have to deal with issues around employee turnover, store transfers, SPIFF management and state-specific rules when it comes to efficiently managing sales commissions. And it gets even more complicated with high transaction counts and selling through multiple channels. With new product innovations being released at lightning speeds, incentive plans and sales operations must also evolve to keep up with these rapid changes. Technology companies face a number of challenges around selling through different channels and managing complex quotas, whilst dealing with an increasingly competitive business environment. Interested in learning more about Sales Performance Management solutions? Copyright © 2019 Innovyne Technologies - All rights reserved.